As a stay-at-home mother of two, it's not always possible to spend hours on my hair. Because of this, I like to keep things simple. The less time it takes, the better. Today, I'm going to share with you my simple, time-saving hair style using a product that is fairly new to me: Rusk Mousse. Rusk Mousse is designed to give hair added volume, control, and shine. It's ideal for blow-drying, but can also be used if you air dry your hair. I personally prefer air drying my hair, as it prevents damage and frizz (not to mention, I can get things done around the house while it's drying out—that's always a plus for me). While going over my hair routine using Rusk Mousse, you'll notice that I use mousse a little differently than most women. I'm happy to report that the product worked beautifully with my routine, as you will see toward the end of this post. Before I get in the shower, I brush my hair out to remove any tangles. I find that this allows the shampoo and conditioner to better absorb into each and every strand. Working shampoo and conditioner into tangles is never fun. Note: About once a week, I also apply fractionated coconut oil to my ends and let it sit for about an hour before showering. This is not required, but I find that it keeps my ends from splitting, especially during the dry winters here in Ohio. After getting out of the shower, I wrap a towel on my head and leave it on for about 30 minutes. This is so that my hair isn't saturated with water when I apply the product. If your hair is saturated, it will not absorb the amount of product that you need to achieve the results you want. This is what my hair looks like after removing the towel. After those 30 minutes are up, I remove the towel and then use my fingers to work through any tangles I may have created while washing my hair in the shower. You can also use a pick for this step. I like to use my fingers, as it doesn't pull and stretch my hair, making it stick straight. This is what my hair looks like after a quick finger comb-through. Once all of the tangles are gone, I take about an egg-size amount of mousse and work it through my hair, from root to ends. Once the mousse has been applied to all of my hair, I use the "scrunch" method to create waves and curls. Basically, what I'm doing here is balling my hair up in a fist and pushing upwards. Next, I flip my head over and do the same to the layers beneath. Below, you'll see what my hair looks like after applying Rusk Mousse and using the scrunch method. At this point, it is beautifully textured, but not quite finished. To finish off the look, I give my hair time to dry. My hair is rather long, so this takes anywhere from two to three hours. You can reduce the drying time by using your blow dryer. However, I recommend using it on the lowest setting, with a diffuser, and while drying, "scrunch" your hair to keep the waves in tact. The reason I let my hair air dry is because it gives me time to get tasks done around the house, plus, I feel that it leaves my waves softer and less frizzy than if I use a blow dryer. Sometimes, I will spend 10-20 minutes applying my makeup while it dries. This is what my hair looks like while it's drying. And finally, this is what my hair looks like after it's completely dry. Beautiful, soft, textured waves. This style is so easy and is perfect for the beach, or just a casual encounter. Rusk Mousse clearly worked its magic on my hair, and I'm very satisfied with the product. I love that it provides volume, as I like to give my hair a boost. Because it's so long, it's often weighed down. The dispenser is easy to press, which allows you to dispense just the right amount of mousse each time. The texture of the mousse is light and airy—much, much lighter than other products that I'm used to. While some might believe this effects the integrity of the product, I can say first-hand that it does not. As a matter of fact, the light, airy texture of the product prevents it from weighing down my hair, which is a welcomed change. Not to mention, the product is highly concentrated, so you needn't use much to achieve the results you desire. After using Rusk Mousse, I can say with certainty that the product is of high quality. My hair received a volume boost and was manageable. The natural waves were bouncy and soft, which is exactly what I was going for. It wasn't hard and "crunchy," which has been a problem for me when using other mousse brands. The scent of the product is clean, but it's also strong. I would honestly prefer it to be a bit less potent, maybe with an added hint of citrus or floral notes, but overall it's not bad. Just a little strong. If you have a sensitive nose, you may not be keen to Rusk Mousse—so keep that in mind. Finally, the amount of mousse you receive is quite a bit. You're looking at 8.8 ounces, which is larger than most bottles of mousse that I buy in stores. At $14.50 per bottle, it's not a bad deal either. Today, you have the chance to win a bottle of Rusk Mousse for yourself. Don't want to wait for the giveaway to end? To purchase Rusk Mousse, head on over to Beauty Care Choices. 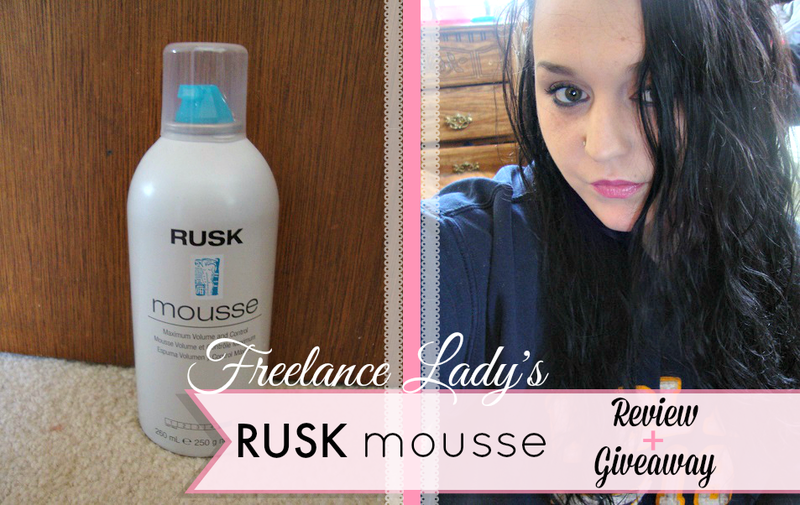 Enter to win an 8.8 oz bottle of Rusk Mousse! Giveaway is open to United States residents, 18+. Void where prohibited. No P.O. boxes. Fraudulent entries will be disqualified. I love that this doesn't leave you hair crunchy. I like that it adds volume. I like that it does not weigh your hair down, I need something like this for my waves because sometimes it does not stay and I need to use a lot of mousse. I love that the product has a light and airy texture. I hate products that feel heavy! I've always loved Rusk brand!!! My personal favorite product is their straight hair cream! I like that it gives your hair volume. I love that it really does add volume. I love the volume it really gives the hair! I like that its light.